It's Hip 2 Serve! 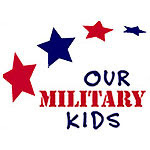 : Our Military Kids...Helping to Fund Military Children's Activities! Our Military Kids...Helping to Fund Military Children's Activities! For any of you that are not familiar with "Our Military Kids," I am excited to introduce you to this awesome organization! Our Military Kids provides grants for sports, fine arts and tutoring to children of deployed National Guard and Military Reserve personnel and to the children of the severely injured service members. These grants are made to honor the sacrifices military parents make and to ensure that the children have access to activities and support that help the children better cope with challenges arising during a parent's deployment or injury recovery. -Any children aged 3 years through 12th grade of National Guard or Reserve military personnel either deployed overseas or severely injured may apply are eligible for a grant. -Family income is NOT a consideration in determining whether a child is eligible to receive a grant. -Eligible activities include youth sports programs (i.e. football, baseball, swimming, tennis, yoga etc. ), fine arts programs (choir, music, theatre etc. ), tutoring programs and more. For a complete list of covered programs, click here. To apply for a grant, click here to fill out an application. Within two weeks of sending or faxing the application to Our Military Kids, the child will receive a special packet in the mail notifying him/her of the grant award. The check will be sent directly to the activity provider. To donate to this organization, click here.